We decided to drive home via I-70 partly because of Flat Stanley, partly because it's much more interesting than Wyoming. Part of what makes it more interesting are the tunnels. to make the interstate more user friendly for cars they carve tunnels through the mountains that you drive through. We also had to pick up Oscar Dog in SLC so it didn't matter which way we went, it would all translate into about a 10 hour drive. As you can see, the weather is perfect for traveling! Others are square like this one. This is the Eisenhower Tunnel, it is 1.6 miles long and is the 4th longest tunnel in the United States. you can see the reflection of tail/brake lights on the ceiling. The green lights tell you the speed limit, or let you know that you are going down the road in the right direction. This one is lit up with white lights. This is a short tunnel, you can see from the beginning to the end. Here we are exiting the tunnels. the tunnel on the right is entering Glenwood Springs, CO where we stop and eat lunch. The bridge you see at the end is the same bridge we rode our bikes over last summer when we went on a "mini" vacation. The first amusing sight of the day was this suburban. It's spotted because we hadn't found an opportunity to clean the windows from our trip over yet, but you can see that this family has dressed their car up like Rudolf the Red nosed Reindeer! This isn't new, but Flat Stanley thought it was cool, this is a runaway truck ramp. When you drive through the mountains and get going down some long steep hills, the big semi-trucks have to use their brakes alot and sometimes they get so hot that they quit working or even catch on fire. So they put these ramps going up a big hill that is made with lots of rocks. The truck drives up into this and it makes them stop. Otherwise they would just go faster and faster and eventually just fly off of a cliff and possibly run somebody over in the process. I've actually only seen a truck on a runaway truck ramp once, but I didn't see the truck drive up, it was already there. This big guy was huge, he took up the entire backseat of this car. The thing that made him fun to watch was that he would stick his head out the window for about 15 seconds, duck in and lay down in the back seat, less than a minute later he was back up with his head out the window for about 15 seconds. We followed this car for probably 15 minutes before we passed him. Ahh, Village Inn. This holds a special spot in our hearts, for it is where we often would, and still do stop for a snack either coming or going on our way to Denver. This particular stop is memorable because of the waitress we had. I had decided on one of my personal favorites, Eggs Benedict, but I do not like my eggs in a living state, so well done is the order of the day. The waitress brought the Geniuses lunch, which was absolutely excellent, it was a cuban pork sandwich or something like that, anyway it was super tasty, at that point I was informed that the cook was having a hard time getting my eggs just right. When I got my eggs, they were perfect! I relayed this message to our waitress who in turn went back to the kitchen and hollered "hey Phil, the eggs for the benedict, they are PERFECTO" the entire restaurant was able to hear her. It was quite amusing. While it was good the cook got the message accurately, the Genius and I just laughed. even though this picture doesn't do it justice. This river is just outside of Grand Junction as you can see the banks are covered with snow and these (I'm assuming) geese are just happy to be there. Then there are the Mountains, Lots of them, which is why they built all those tunnels. These pictures, like the mountains, speak for themselves. 'Quintessential" mountain, which translates as: The perfect example, which in this case is a mountain. (yes, I had to look up the definition when we got home) sharp peak, snow-capped, tree line. . .
Not only are these cliffs beautiful, but the reflection of the dash in the van gives it a cool effect. This is why I enjoy going over I-70, even when I don't have to drop off the Dog in SLC, or Wyoming roads are closed. It is beautifully scenic. . . . there isn't much more to say than that. Even this is nothing to compare to the scenic majesty of going the long way of Hwy 40, that is quite possibly the most exquisitely beautiful drive I've had opportunity to see. 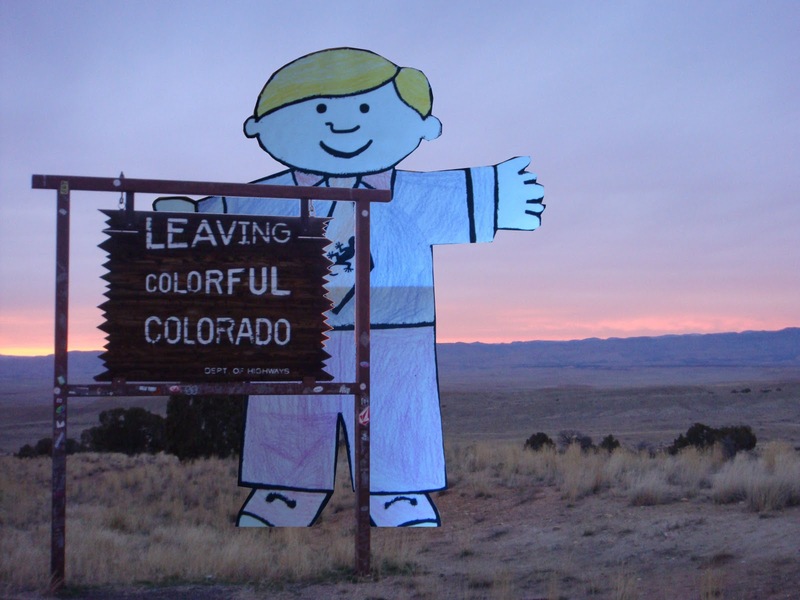 Flat Stanley had a great Thanksgiving visit, and while Colorado is beautiful, it's always good to go home. Home is where the most comfortable beds are. We decided to have fun with Stanley as we said goodbye to colorful Colorado. Utah is pretty colorful too. . . . This picture is a little funny. The genius purchased a leather coat on black friday that had this fleece insert that zips into the coat. When he wears it alone he reminds me of an "ewok" from Star Wars or something. It's a long drive from Denver to Home, and strange things start to happen to the brain. . .
this beautiful Sunset was taken just after we crossed the border into Utah. The Genius was sawing logs at this point so the picture itself is a little fuzzy, I mean, take the challenge to get a perfect shot while driving down the interstate, not so easily done. but the colors are still wonderful as the sun sets. I find it amazing the time difference between each of the three sunset pictures is between 10 and 15 minutes. It was plenty cold, even the windshield water at the gas station was starting to freeze. Tail lights are starting to accumulate in a long line as holiday travelers, like us, are heading home, out of the canyon leaving Price, Utah. Which means we are almost home, always a welcome sight. Without question, Thanksgiving is my favorite Holiday of the year. We usually go to Denver to Celebrate this holiday. Our big mistake this year was debating the entire morning whether we should even go or not. The roads where we live were absolutely horrid from the blizzard the previous day. According to the internet, Evanston, WY was closed as was Rock Springs. However road conditions into Colorado were looking favorable with the exception of a winter storm advisory for Glenwood Springs. Finally we decided to just go for it, we were dropping Oscar Dog off at the daughter's, (they decided they wanted to spend the holiday with the hubby's family instead of us). . . . how boring! Before leaving on any trip we check little things like the oil, brake fluid, window washer fluid, those kinds of things. The genius helped out on this years inspection. When we stopped for gas we picked up a treat for ourselves too. It's always good to have something to snack on during the long drive. This would be a super long drive because it would be LATE when we arrived. Mine is the "good & plenty", the genius picked up the drink and chips. Before we would get back home, I would go through two packages of these, one on the trip there, the other for the journey home. I like black licorice and these little guys make a great munchy, but not messy,snack food. I don't like salt and gunk stuck to my fingers while I am driving, so chips, or cheetos and stuff like that aren't my favorite travel snacks. These are power wind mills. It was almost dark but you could see them clearly. Since we were looking for amusing things to show Stanley I thought I would show them to everyone else too. As we arrived into Denver we found this display of lights at a business that was stunningly beautiful. 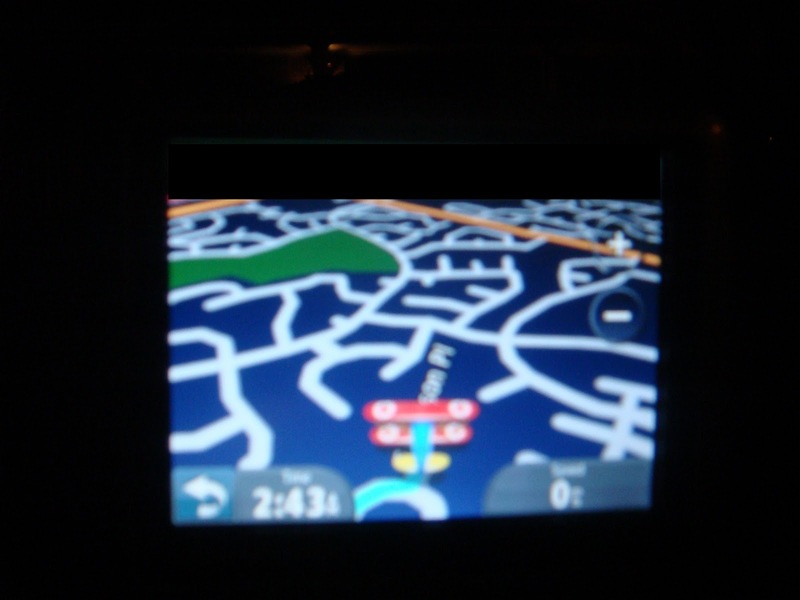 This is our GPS device. The genius gave this to me for Christmas last year and I use it all the time. It is quite possibly my favorite and most useful gift I have ever received. One of the reasons I like this little device is that I am positively one of the most pathetic directionally impaired individuals ever born. I get lost even when I know where I am going. Today was no different, in fact it was at its worst. As we approached the outskirts of Denver the little man, who gives me excellent directions and keeps me on the right track told me to take a cut off, but at 1:50 am I wasn't listening, in fact I completely ignored my little man faithfully hanging in the window, because I was confident he was WRONG! I told the genius to turn him off to keep him quiet. Every exit I came to he would politely but firmly inform me that he was "recalculating" and then take the next exit, turn etc. As I became weary of listening to him we simply turned him off. This turned out to be a BIG mistake! As we cruised down I-70 it became apparent that I should have listened to the advise of the GPS, nothing was looking familiar, street names anything at all. Not only that, but the estimated time of arrival to our destination was increasing by the mile. I quickly repented and had the genius turn on my voice hanging in the window, but he was not giving me directions. We decided that he was mad at me and not talking to me any longer. If you are confused by the above illustration/map, you should have been there with the Genius and myself at 2:30 am wandering lost and lonely in the streets of Denver, Colorado! fortunately for us, most people were at home, so traffic wasn't a problem, we pretty much had the streets to ourselves. As you can see, we went for quite the tour! At step #5 on the list, we re-entered our destination and he, my little man hanging in the window, quickly began giving me instructions. It was dark, I couldn't see the road very well, it was late (or early if you would prefer to look at it like that), and I was tired, but I couldn't see where he wanted me to turn, so we missed it and drove further off track. I turned a u-turn and we attempted once again, we still missed it. Finally my little man hanging in the window began giving new directions. I followed faithfully. We were directed to follow Wadsworth and then to take the ramp to I-25. He kept telling me to keep left, at this point there was a fork in the highway one to Ft. Collins the other to Colorado Springs. As we came to this fork, my little man suddenly directed me to go North (right), but I was staying left and didn't catch the change in direction soon enough, so Ft. Collins it was. 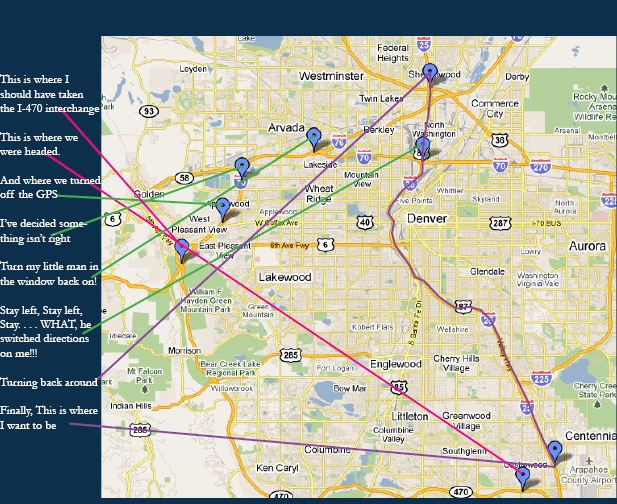 We were now in Downtown Denver, quite a bit past where we wanted or rather needed to be. Finally, following directions from the little man hanging in my window we once again got turned around and going the right direction. 45 minutes later we arrived. How grateful we were. They were waiting up for us and had the light on. Bed that night felt so great! I slept like a rock. This is our trusty van, absolutely caked in salt from the trip. I realized the next day that part of the reason I was having such difficulty seeing the road was that our headlights were so plastered in this white film of salt that they were hardly shining. Temperatures for the entire trip were cold and the top of the van never thawed out from the remains of the blizzard from the night before we left home, 600 miles later it was still frozen & crusty. Some of the roads were wet and snowy, even a little icy in spots, but nothing came from the sky. so this is most definitely left over from our storm before leaving. The table is looking like Thanksgiving, I'm so excited, good food, turkey, mashed potatoes, salad, rolls, pie. just thinking about it makes me hungry. However, preparations didn't go so swell. I wonder if it all started when I turned off my GPS? I was given the responsibility of making the cranberry/orange salad. I felt pretty confident that I could tackle this task with ease, so quickly began my project, the first dish of the day. The problem was that the thermometer I was using was off, so my sugar solution slightly over cooked, well, okay excessive is probably a better description. as I dumped the cranberries in to cook until they "burst" they didn't even have a chance. The sugar mixture completely solidified around them making a big glob. It was actually kind of cool, the sugar just peeled off of the cranberries like a cocoon. This is Tom Turkey, he looks wonderful both getting dressed for the oven, and coming out. but we were to quickly discover that Tom wasn't quite cooked all the way. translation, no dark meat today. We cut off the breast meat, microwaved it until we felt good about it and turned the rest into turkey stew. This is the yams, they look so scrumptious, but we think the cousin-in-law added too much OJ and they came out floating in itself, it didn't taste bad, the description was more like yam stew, tasty, but very soupy. The cranberry salad that I tried to destroy earlier, turned out beautiful, and very good. Stirring, mixing and getting ready for dinner. Everything smelled so good, that is what helps to make Thanksgiving memorable. Aunt T, used a yukon gold potato in place of russets, which should have been fine, but they turned out a little gluey, okay, alot gluey. The rolls were a hit, the stuffing was a little dry, oops, that was my fault! I was planning on using drippings from the turkey, but there weren't very many and we needed them for the gravy which turned out fabulous, but I didn't add enough moisture in the stuffing, so it was pretty dry. When we arrived in Colorado, it was late and I thought to make things easier and faster we just left the pies in the van. it was definitely cool enough that I wasn't worried about refrigeration, but even though there was no snow, it was a little too cold and my banana and banana cream pie became frozen, frozen bananas don't look to swell, in their skins or in a pie. This is the pie the genius made, Apple/Cranberry, it thawed very beautifully and was most definitely the best looking pie there. The friend and the genius both made one, the friend said his pie was a hit too. Even though the banana cream pie didn't look so swell, the report was that it tasted great, I have to admit it was pretty good. YUMMY. . . Thanksgiving pie! they had made their own pumpkin filling from a pumpkin from the garden, it didn't turn out to well, and we ended up throwing it out, we're not sure what happened to the pecan pie, it was just runny, kind of like the sweet potatoes, only with pecans. In short, Dinner was a hit for very memorable and interesting this year, but not for fabulous.I still love Thanksgiving, and Colorado, like I mentioned earlier, Thanksgiving is all about family, fun, and memories. . . which we have plenty of! I wouldn't trade those for anything! Thanksgiving is over and now it's time to get ready for Christmas! As tradition dictates, the genius and the Cousin-in-law braved the crowds for "Black Friday" deals and shopping. They came home exhausted and took a nap. Next, I helped Aunt T. prepare for Christmas, we put out the Christmas decorations, inside and out! First, the inside gets a new look. We weren't there when they got the tree, but the beginning transformation from one holiday to the next is pretty exciting. First the inside gets a new look, then outside for lights. It was actually a pretty nice day, even though it was still a wee bit chilly, it was tolerable. Better than the weather we left the day before coming here! I think I would have said, never mind in sub-zero snowy temps. Christmas lights at night are the best. One of my favorite things is to drive around and look at the lights. I tried to put up lights at our house one year and it was a disaster. living in an older home that doesn't have enough outlets for the functioning of our modern day appliances is challenging enough, adding Christmas lights didn't work at all. 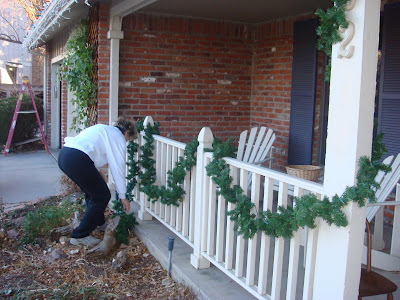 we had to plug them in from inside the house which meant that I cut a small trough out of the threshold to drag the cord in and still close the door, (some call me "resourceful") then the breakers kept tripping, in short it was a bigger pain than it was worth. So, if I ever get a house with a bigger kitchen, I will also make it so I can put up Christmas lights too!